The MakerBot Replicator Mini+ combines portability with ease-of-use and lasting reliability. You can now print 10% faster, easier, and with a 28% bigger build volume than its predecessor. To ensure consistent performance, our new 3D printers and their subsystems were re-engineered and rigorously tested for over 380,000 hours across multiple facilities. The MakerBot Replicator Mini+ is 58% quieter when printing, allowing a more focused work environment. With MakerBot Mobile, get up and running faster with guided wireless setup. Control multiple printers from MakerBot Print so you can print on multiple build plates sequentially or simultaneously. Our support team offers comprehensive coverage plans and responsive expertise from those who know MakerBot products best. We also offer both intelligent troubleshooting and in-depth product information. 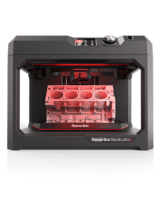 The MakerBot Replicator Mini+ comes packed with features to ensure easy, accessible 3D printing such as an on-board camera as well as Wi-fi and USB connectivity. Pair the system with advanced software such as MakerBot Print and MakerBot Mobile to take full advantage of wireless cloud-enable connectivity and the ability to import native CAD files, auto-arrangement and multi-printer printing. With the new Grip Surface, prints adhere better, resulting in reduced warping and curling- without the need of blue tape. The build plate is also factory-leveled so your Replicator Mini+ is ready to go right out of the box. Consistent Printing in a Variety of Eye Catching Colours. Shop online for all your MakerBot needs. New products, accessories and materials all in one place.